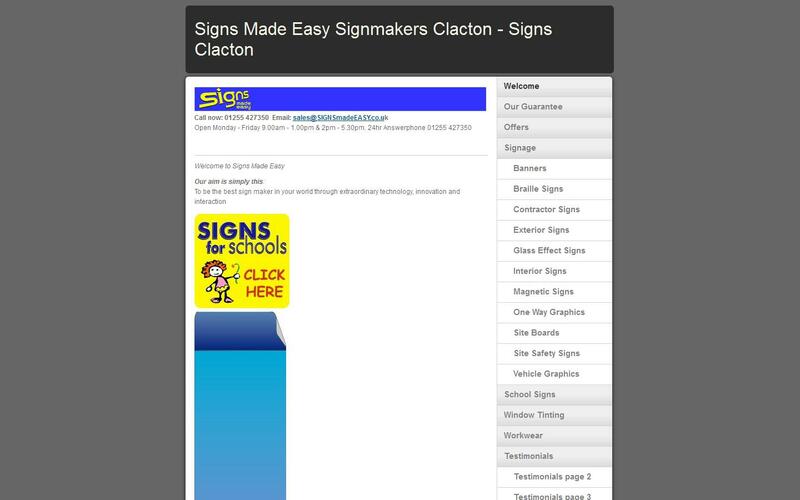 Signs Made Easy based in Clackton-on-Sea, Essex, are a family run business with 30 years’ experience in the manufacture and installation of a wide variety of signs. We operate in Clacton, North Colchester and the surrounding areas and are one of the longest established sign makers in the area. Over the years, we have built a solid client list with some customers using our service for more than 20 years! Clients include Essex County Council, Bourne Leisure, Tendring District Council and many more. All Signs Made Easy products are manufactured in-house using the latest technology, therefore enabling us a company to provide fast turnaround and products at affordable prices. Signs Made Easy also offer a fully online UK mailout sign service and have recently relocated to a large showroom where many of our products are on display. We are committed to providing a high level of standard for each and every one of our clients, ensuring they are left completely satisfied with a product which makes a lasting impact on their business for many years to come. We have been working with Signs Made Easy for a few years now, and they provide an outstanding services. All orders have been of a high quality, any issues are resolved quickly and turn-around is always fast!